Nikola Ljushev is the Chief Executive Officer of Makedonski Telekom as of 1 July 2018. He gained his extensive experience in the telecommunication industry on top-level management positions in the Deutsche Telekom Group, in Cosmofon and in the Telekom Austria Group. 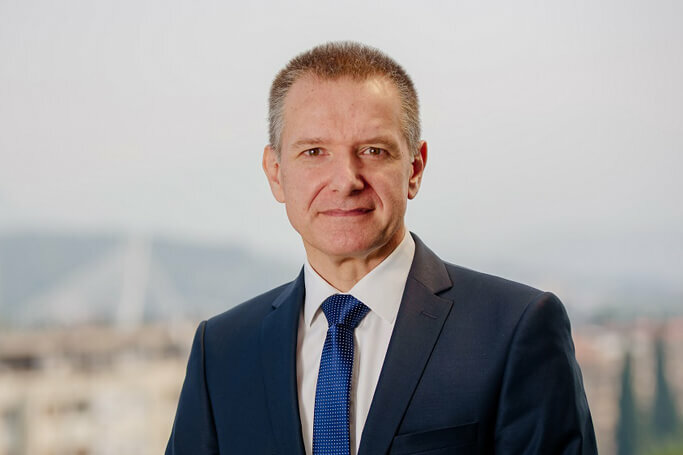 He joins Telekom from the position of Chief Executive Officer of Crnogorski Telekom (member of Deutsche Telekom Group) where he achieved excellent results and assured company growth. Before joining the Deutsche Telekom Group, Ljushev was member of the executive management team of Telekom Austria in Macedonia as Chief Executive Officer of Vip operator from 2007 until 2015, and after the merger of Vip and One, he was also Executive Director of one.Vip in the period 2015 - 2016. He started his career in Makedonski Telekom back in 1997. Mr. Ljushev holds BSc in Electrical Engineering in the area of electronics and telecommunications and additional education in corporate management from prestigious international schools and universities, including the Harvard Business School, INSEAD, University of Chicago etc. The influential magazine Global Telecom Business – London awarded him as one of the top Forty-Under-Forty executive directors in the telecommunication segment worldwide, twice, in 2010 and 2011.